Another online scandal has been gathering pace recently. Wikipedia, the free encyclopedia, deleted an article by a Russian researcher, who wrote about the USA’s losses in the Great Depression of 1932-1933. Indignant bloggers began to actively distribute the article on the Russian part of a popular blog service known as Livejournal. The above-mentioned article triggered a heated debate. The researcher touched upon quite a hot topic in the article – the estimation of the number of victims of the Great Depression in the USA. The material presented in the article apparently made Wikipedia’s moderators delete the piece from the database of the online encyclopedia. The researcher, Boris Borisov, in his article titled “The American Famine” estimated the victims of the financial crisis in the US at over seven million people. The researcher also directly compared the US events of 1932-1933 with Holodomor, or Famine, in the USSR during 1932-1933. In the article, Borisov used the official data of the US Census Bureau. Having revised the number of the US population, birth and date rates, immigration and emigration, the researcher came to conclusion that the United States lost over seven million people during the famine of 1932-1933. “According to the US statistics, the US lost not less than 8 million 553 thousand people from 1931 to 1940. Afterwards, population growth indices change twice instantly exactly between 1930-1931: the indices drop and stay on the same level for ten years. There can no explanation to this phenomenon found in the extensive text of the report by the US Department of Commerce “Statistical Abstract of the United States,” the author wrote. Analyzing the period of the Great Depression in the USA, the author notes a remarkable similarity with events taking place in the USSR during the 1930s. He even introduced a new term for the USA – defarming – an analogue to dispossession of wealthy farmers in the Soviet Union. “Few people know about five million American farmers (about a million families) whom banks ousted from them lands because of debts. The US government did not provide them with land, work, social aid, pension – nothing,” the article says. The then state of affairs in the US society can be seen in Peter Jackson’s movie King Kong. The movie starts with scenes of the Great Depression and tells the story of an actress who did not eat for three days and tried to steal an apple from a street vendor. There is food in the city, but many people had no money to buy it in unemployment-paralyzed New York. People starve in the streets against the background of stores selling a variety of foodstuffs. At the same time, the US government tried to get rid of redundant foodstuffs, which vendors could not sell. Market rules were observed strictly: unsold goods should always be categorized as redundant and they could not be given away to the poor because it could cause damage to businesses. A variety of methods was used to destroy redundant food. They burnt crops, drowned them in the ocean or plowed 10 million hectares of harvesting fields. “About 6.5 million pigs were killed at that time,” the researcher wrote. 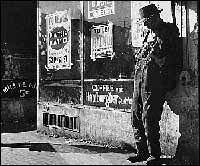 So-called public works introduced by President Roosevelt became a salvation for a huge number of jobless and landless Americans. However, the salvation was only a phantom, Boris Borisov wrote. The works conducted under the aegis of the Public Works Administration and the Civil Works Administration were about building channels, roads or bridges in remote, wild and dangerous territories. Up to 3.3 million people were involved in those works at a time, whereas the total number of people amounted to 8.5 million, not to count prisoners. The conditions, under which people were working for food, could be compared to Stalin’s GULAG camp. “The Public Works Administration (PWA) bore a striking resemblance to GULAG. The PWA was chaired by “American Beria,” the Secretary of Interior Affairs, Harold Ickes, who threw about two million people into camps for the unemployed youth,” Borisov wrote. “Harold LeClair Ickes (1874–1952) later interned USA’s ethnic Japanesein concentration camps. The first stage of the operation took only 72 hours (1941-1942). “In 1940, the US population was supposed to make up at least 141.856 million people upon the preservation of previous demographic trends. As a matter of fact, the USA had the 131.409-strong population in 1940, of which only 3.054 million can be explained with changes in migration dynamics. Thus, 7.394,000 people simply do not exist as of 1940. There are no official arguments to explain the phenomenon,” Boris Borisov wrote. It is worthy of note that modern-day Russian patriotic historians reject methods of research based on the general estimation of demographic losses. They believe that demographic processes are not linear and depend on a number of factors. Such historians think that victims of communism estimations made on the base of demographic research works by Stephan Kurt and Richard Pipes, which George Bush and Helen Bonner announced at the opening of Victims of Communism Memorial Foundation in Washington, are false. On the other hand, these methods are widely used in contemporary science of history. Ukrainian historian Stanislav Kulchitsky used the method to calculate the number of victims of the Ukrainian Holodomor (famine), which was subsequently officially recognized. Parliaments of eleven countries that recognized Holodomor use those numbers in their research works. To crown it all, the US Congress and the European Union also use Kulchitsky’s numbers considering the problem.